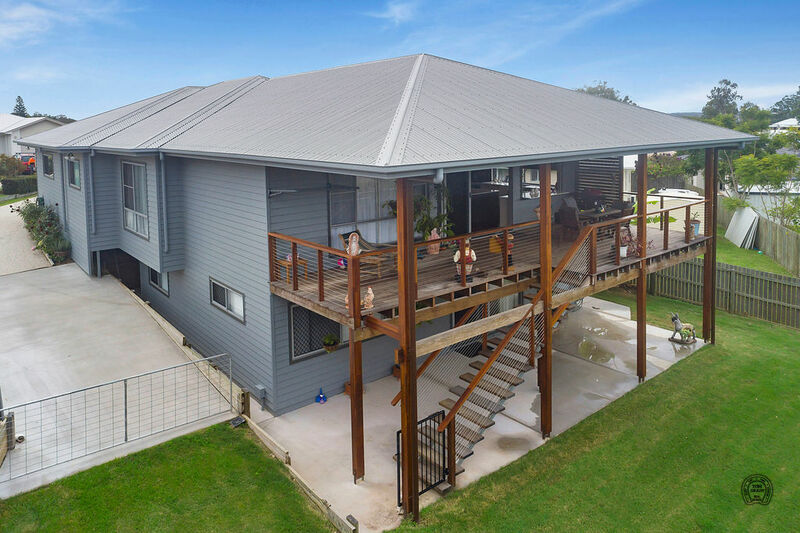 Description: Beautifully finished this one year old home sets a precedence for luxury living on a 1040m2 block of land on Gympie's Southside, within close proximity to shops, schools, medical providers and renowned eating outlets. Designed for everyday enjoyment, the generous floor plan incorporates a living and dining room adjoining the tastefully appointed kitchen with stone bench tops, butler's pantry and a vast island bench inclusive of a breakfast bar. Flowing on, the full length wooden deck overlooks the private backyard. The exceptional master suite is complete with a stunning ensuite and walk-in robe. Also located on this level is a study offering a handy workspace, second bedroom, bathroom, media room and a double remote controlled garage. This comfortable living space has high ceilings, hard wood floors and ducted air conditioning. Downstairs the family room offers another generous living space and there are two substantial bedrooms each with built-in robes and fans. Finally another bathroom, laundry and patio offering possibilities for dual living if needed. Additional features of a concreted driveway to a powered 10 x 10m shed with high clearance, a mezzanine floor, laundry facilities and a toilet. Also 5 kilowatts of solar, a fenced back yard with space for a pool and an easily maintained landscaped yard. Only upon inspection will you fully appreciate what this property has to offer. Why build when you can buy this immaculate home only one year old?